Nerve damage is often permanent, but a team of US researchers has developed a first-of-its-kind, 3D-printed guide that helps regrow both the sensory and motor functions of complex nerves after injury. “This represents an important proof of concept of the 3D printing of custom nerve guides for the regeneration of complex nerve injuries,” said the study’s lead researcher Michael McAlpine, mechanical engineering professor at University of Minnesota in the US. 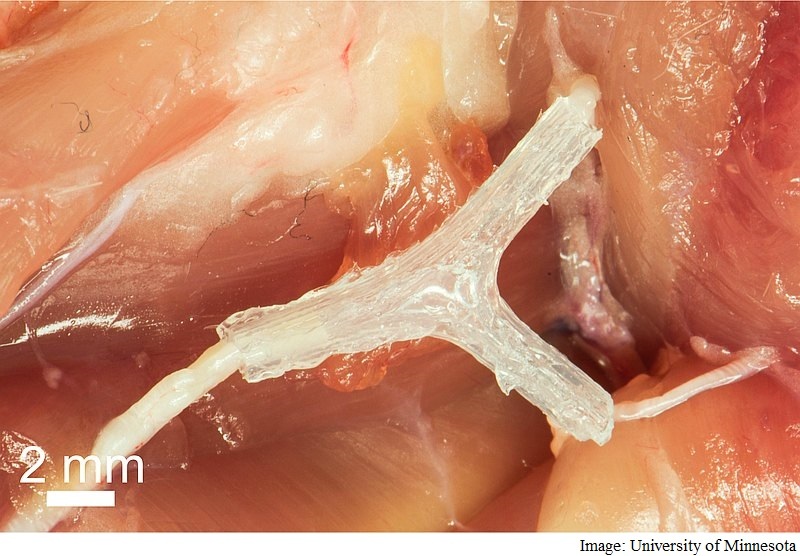 In the study, researchers used a combination of 3D imaging and 3D printing techniques to create a custom silicone guide implanted with biochemical cues to help nerve regeneration. The guide’s effectiveness was tested in the lab using rats. To achieve their results, the researchers used a 3D scanner to reverse engineer the structure of a rat’s sciatic nerve. They then used a specialised, custom-built 3D printer to print a guide for regeneration. Incorporated into the guide were 3D-printed chemical cues to promote both motor and sensory nerve regeneration. The guide was then implanted into the rat by surgically grafting it to the cut ends of the nerve. Within about 10 to 12 weeks, the rat’s ability to walk again was improved. “The exciting next step would be to implant these guides in humans rather than rats,” McAlpine said. “Someday we hope that we could have a 3D scanner and printer right at the hospital to create custom nerve guides right on site to restore nerve function,” McAlpine said. The study was published in the journal Advanced Functional Materials.